Adam Otstot, for the 3rd year in a row, won first place in both the International and Sprint Triathlons. His winning weekend resulted in setting new course records in both the International and Sprint Triathlons. We caught up with Adam post-race and asked him a few questions. The weekend was absolutely fabulous. I traveled to Luray with my wife, Tori, and we had the best time. After huddling in the Lifeguard Shack during a crazy thunderstorm during the International Pre-Race Briefing, we checked in at the Woodruff House and then visited several shops on Main Street before eating dinner at 55 East Main. The weather was perfect Saturday morning, and I held off a ferocious charge by Ricky Flynn to defend the International event title. A few hours later we went back to the beach at Lake Arrowhead for the Sprint Pre-Race Briefing. 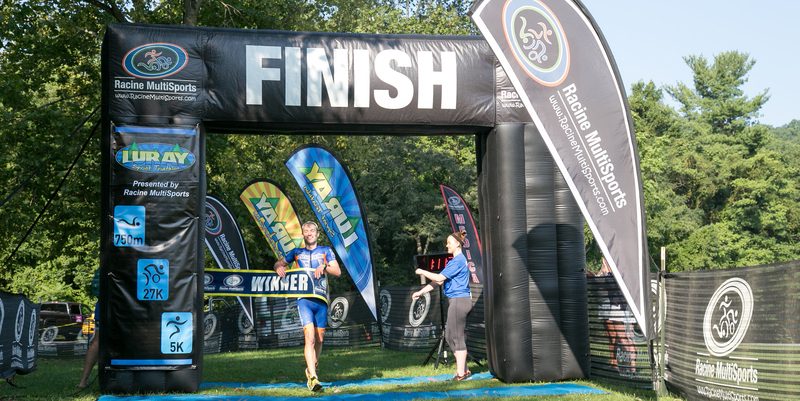 There was a large turnout and a lot of new or novice triathletes who were excited to race! As usual, I woke up Sunday morning a little worse for the wear (with a tough race in me the day before), but I pulled myself out of bed, slammed a large cup of coffee and got on with it. I felt great out on the race course and rode the bike aggressively to secure the second victory of the weekend. How did you feel about breaking both course records? Breaking both course records gives me a lot of confidence. Since 2015, I have been able to use Luray as a benchmark to gauge my fitness level. I know that I am heading into the remainder of the year in great shape. It is validation that the hard work I am doing day in and day out is paying off. This is 3 years in a row that you have won first place in both the International and Sprint Triathlons. How does it feel? Have you done that in any other triathlons? It always feels good to win a race, and to have an undefeated record in Luray magnifies that feeling. I won the Patriots Half in Williamsburg, Virginia five times in a row from 2011-2015, but outside of that, Luray is my longest winning streak in triathlon. There is no substitute for coming into a race physically and mentally prepared. Definitely my coach, Dave Luscan, and my wife, Tori, play huge roles in getting me to the starting line in peak form. I train and race with excellent equipment and apparel from the Snapple Professional Triathlon Team, and ultimately the course suits my strengths very well. The swim is my relative weakness. Lake Arrowhead is always calm and predictable, which keeps me close to the fast swimmers and allows me to unleash the bike and run strengths that have separated me from the rest of the field in the past. Racing for the prize money is incredibly motivating for me, but additionally now that I have this streak going I am motivated to do what I need to in order to keep the streak in tact. Next year I’m also motivated to see if I can be the first person to ever go under 2 hours in the International race. In both races, there was one triathlete who managed to gain a sizable gap on the front pack in the swim. I stayed with the front pack in both races, and then I took off in pursuit of the leader on the bike. In both races I took the lead right around mile 2 of the bike and attempted to gain as much time as I could on the bike course. Oddly in both races I ended up with a lead of about three and a half minutes off the bike, and I ran fast enough to manage the lead all the way through to the finish line. In the International, I wasn’t completely confident that I would win until I was about a half mile from the finish. I was a lot more confident with a 3 minute lead starting the 5k in the sprint. In that race, barring any unforseen event, I knew I would win. At what point did you realize that you were going to break the record? I didn’t know I had broken either course record until after I finished each race. In the International, it turned out that I had to break the course record in order to win, so it was a byproduct of racing off the front and holding the lead. In the sprint I felt amazing coming off the bike, so I kept the effort up with the thought that I might be able to break the course record. Luckily the legs held up, and I was able to do it! What did you like most about race weekend? I have two memories that stand out. On Saturday afternoon at the Pre-Race Briefing, I met a triathlete that asked a question about whether or not one could dismount their bike in the middle of the bike course. She was mildly concerned about being able to cycle the final climb in its entirety without having to step off the bike. Luckily on my cool down run on Sunday after the sprint, I happened to see this athlete. I found out that she stayed on her bike the entire course and conquered those demons. The second was being able to spend some quality time with my Snapple teammate Colin Riley and his family and to see two of the athletes that I coach finish their respective races. What advice can you give other triathletes? Set some goals, get a support system around you, and have fun. If it’s fun, you’ll keep coming back! Absolutely! I have to defend my titles!